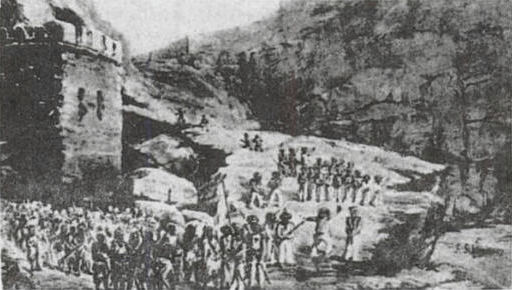 On this date in 1839, the British East India Company landed Royal Marines at Aden to secure the territory and stop attacks by pirates against British shipping to India. 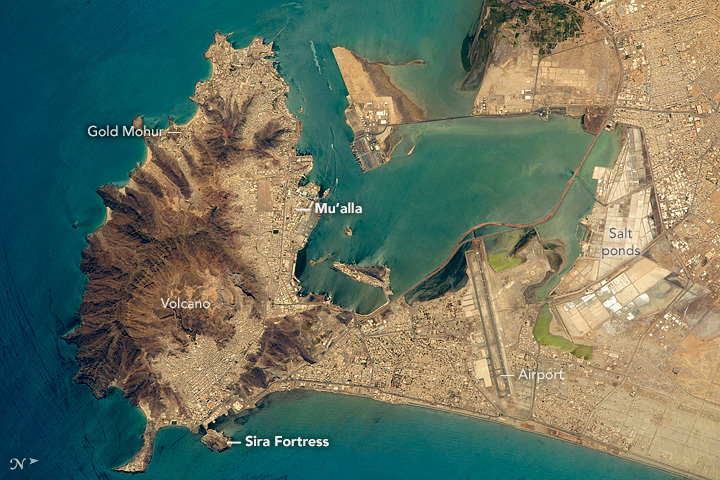 Before British administration, Aden was attacked by the Portuguese between 1513–1538 and 1547–1548. It was ruled by the Ottoman Empire between 1538–1547 and 1548–1645. In 1609 The Ascension was the first English ship to visit Aden, before sailing on to Mocha during the Fourth voyage of the East India Company. After Ottoman rule, Aden was ruled by the Sultanate of Lahej, under suzerainty of the Zaidi imams of Yemen. In the early 19th century, Aden was a small village with a population of 600 Arabs, Somalis, Jews and Indians—housed for the most part in huts of reed matting erected among ruins recalling a vanished era of wealth and prosperity. In 1838, under Muhsin bin Fadl, Lahej ceded 194 km2 (75 sq mi) including Aden to the British. Once Royal Marines had secured Aden it was declared a free trade port with liquor, salt, arms, and opium trades developing duties as it won all the coffee trade from Mokha. The port lies about equidistant from the Suez Canal, Mumbai, and Zanzibar, which were all major British colonies. Aden had been an entrepôt and a way-station for seamen in the ancient world. There, supplies, particularly water, were replenished, so, in the mid-19th century, it was used to replenish coal and boiler water. Thus, Aden acquired a coaling station at Steamer Point and remained under British control until 1967. 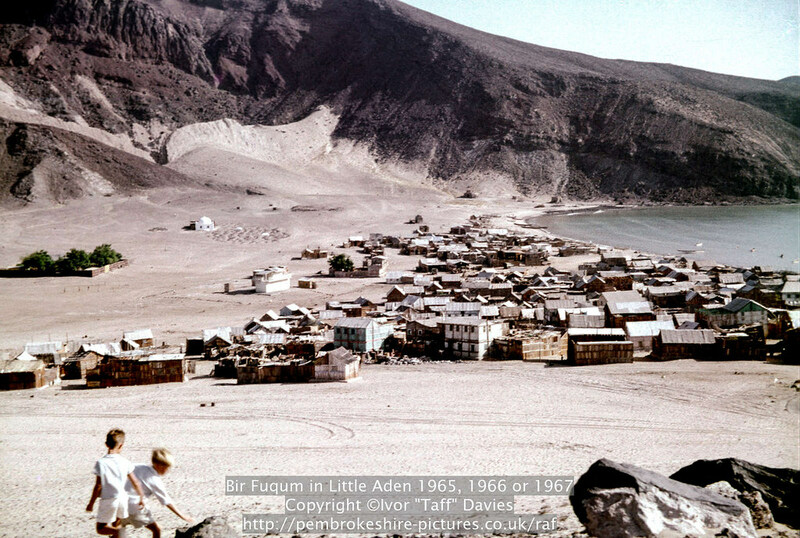 Until 1937, Aden was governed as part of British India and was known as the Aden Settlement. Its original territory was enlarged in 1857 by the 13 km2 (5.0 sq mi) island of Perim, in 1868 by the 73 km2 (28 sq mi) Khuriya Muriya Islands, and in 1915 by the 108 km2 (42 sq mi) island of Kamaran. The settlement became Aden Province in 1935. In 1937, the Settlement was detached from India and became the Colony of Aden, a British Crown colony. 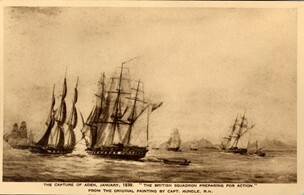 Aden’s location also made it a useful entrepôt for mail passing between places around the Indian Ocean and Europe. Thus, a ship passing from Suez to Bombay could leave mail for Mombasa at Aden for collection. The 1947 Aden riots saw more than 80 Jews killed, their property looted, and schools burned by a Muslim mob. After the Suez Crisis in 1956, Aden became the main location in the region for the British presence. Little Aden is still dominated by the oil refinery built for British Petroleum. Little Aden was well known to travelers for its tanker port with a very welcoming seaman’s mission near to the BP Aden tugs’ jetties, complete with swimming pool and air-conditioned bar. The accommodation areas for the refinery personnel were known by the original Arabic names of Bureika and Ghadir. Bureika was wooden bunkhouses built to accommodate the thousands of skilled workers and laborers brought in to build the refinery, later converted to family housing, plus imported prefabricated houses “the Riley-Newsums” that are also to be found in parts of Australia (Woomera). Bureika also had a protected bathing area and Beach Club. 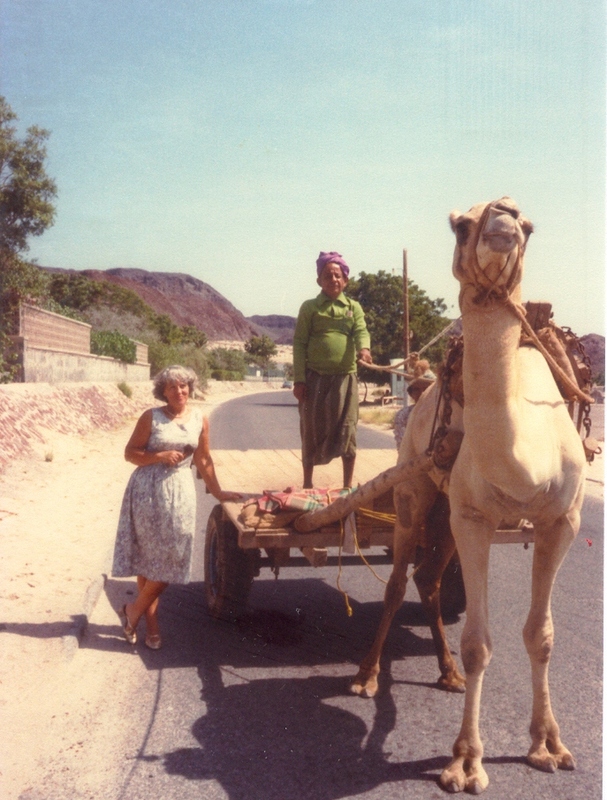 I have very fond memories of a visit to Aden in 1958 when my family migrated to Australia from England. Aden was an important refueling port, giving passengers time to go ashore. I was six years old, but remember certain parts very clearly. We had one day in Aden and I was blown away. The ship had stopped in Gibraltar, but we did not get to go ashore. It was stunning to see the Rock, but that was it. We went ashore in Naples and I was very impressed by Vesuvius, which at that time had a thin thread of smoke and steam snaking from the crater. That was impressive. But Aden was another world. Men wore robes and turbans, camels roamed the streets, and people sold various items right out in the open streets. At one point, my father suggested that we have a Coca-Cola because it was a hot day. At first I had no idea what he was talking about because we never had soft drinks in England. I thought it was some exotic Arabic concoction because it came in a strangely fluted bottle with the name on the bottle in Arabic. A new world of taste opened up to me at that moment. I also saw a clockwork camel in the bazaar that I thought was fascinating, and, seeing, the light in my eyes, my father bought it for me. There were many clockwork animals on sale, such as a giraffe whose head rotated in complete circles. I was not interested. The camel just walked in a steady manner with bobbing head, like the real camels I saw. I kept that camel for 50 years. Normally I’d advise you to fly to Aden if you want the real deal, but I don’t think that’s advisable these days. Besides, Saltah is reasonably easy to create at home as long as you can get fenugreek from Yemen. Not sure about that.